I have been pinning busy bags for quite some time, but just haven't had the motivation to make any! I have a Doctor's appointment tomorrow and have to take Elijah with me, so I thought now was a good time to give them a shot to see how well they keep him entertained. If all goes well I plan to make some more for him. 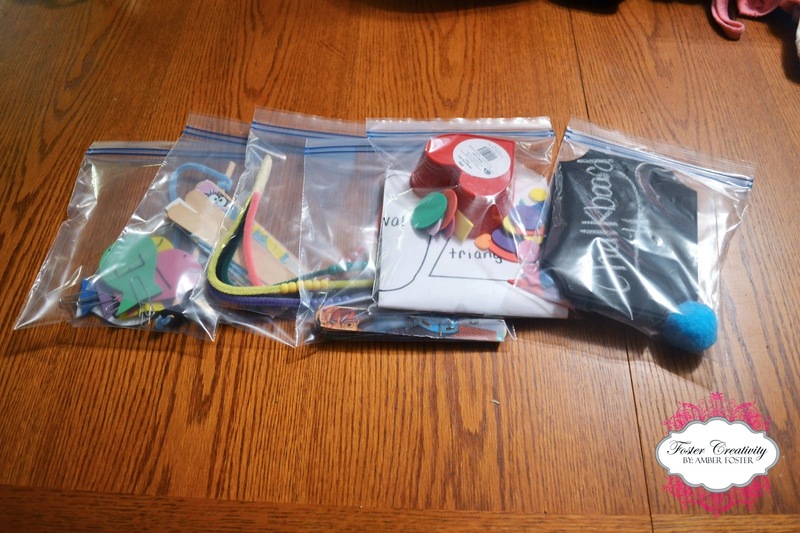 If you have never heard of busy bags, then let me tell you a little bit about them. They are a small toddler or childrens activity that can be contained in a bag that you only bring out at special times that you really need your toddler or child to be entertained. I put mine in quart sized zip lock bags, but I have also seen them put into pencil bags and kept in a binder. That may be something I do in the future, but today I just used materials I had on hand at home for all of my bags. Today I made a total of 5 bags. The first one I made was very simple. 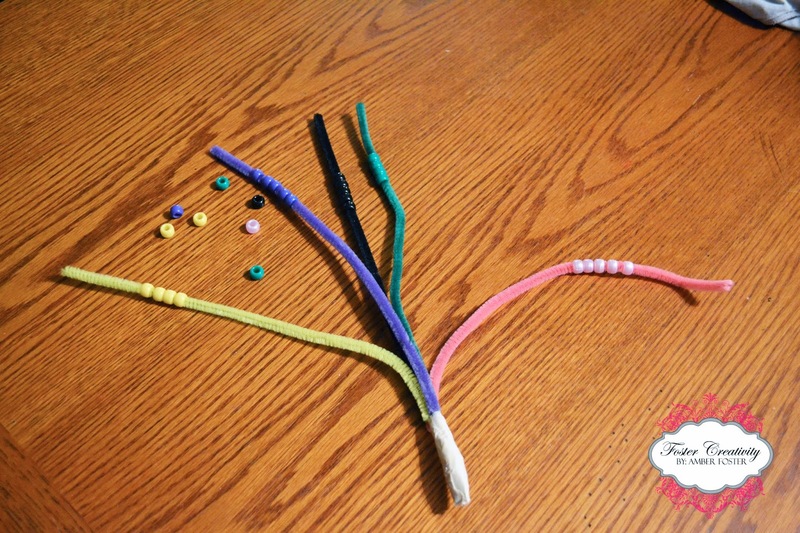 It's just pipe cleaners taped together at the bottom with tiny beads that he can string onto them. It's not required that he match the bead to the pipe cleaner, but I thought I would make them match so he would have that option if he chose to do that. 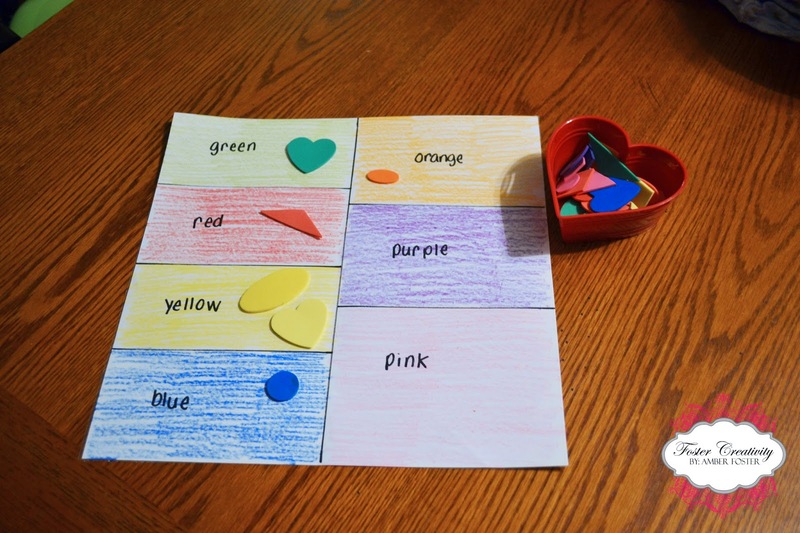 This activity it great for working on sorting and fine motor skills. 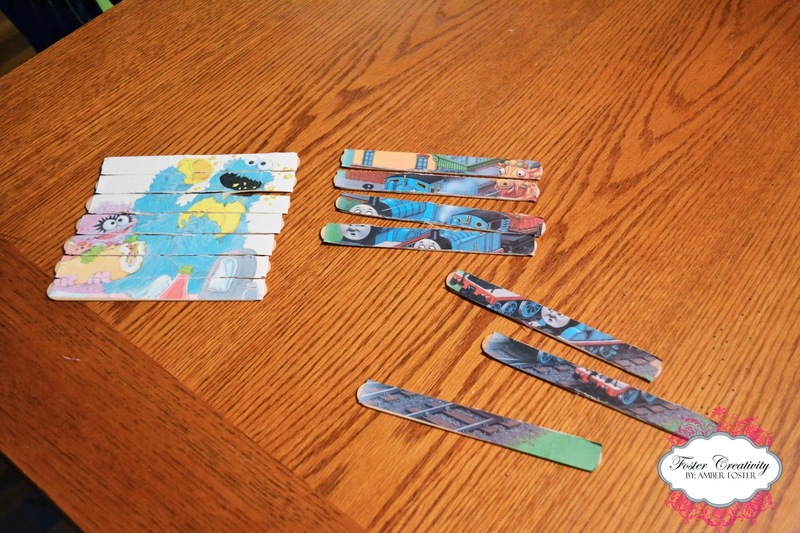 The second busy bag is home made popsicle stick puzzles. I took 2 pictures from some old damaged books I had and mod podged them onto jumbo sized craft sticks. After they were dry I then cut the sticks apart. If you don't have mod podge school glue would work just as well. I had originally intended to print off some pictures of his favorite cartoon characters, but my printer ran out of ink! These would also be fun to do with family/pet photos. After completion of these I realized this activity may be a little difficult, but he may surprise me! The third busy bag is a tiny chalkboard that I made from a small 6" plaque that I spray painted with chalkboard paint. 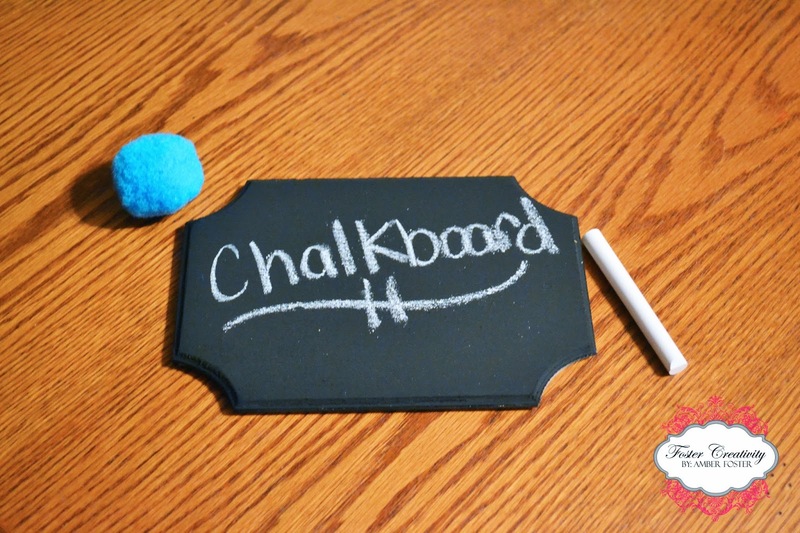 I included a piece of chalk and a large pom pon for erasing. 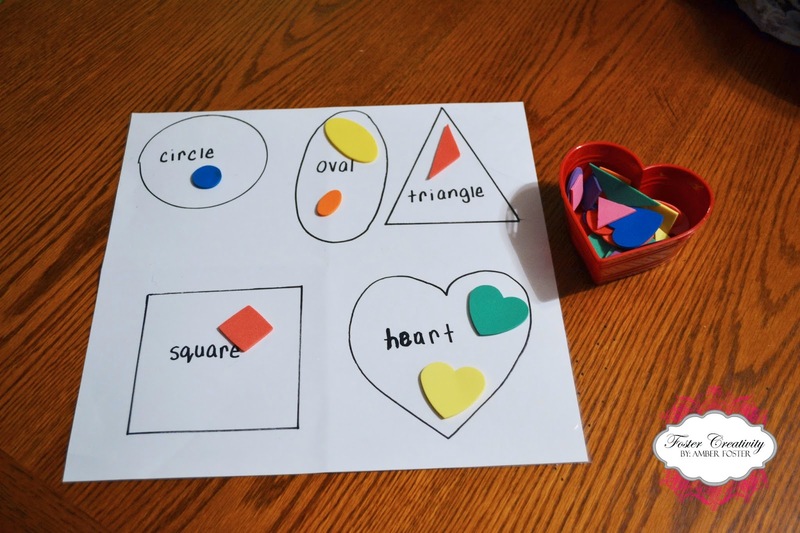 The fourth busy bag is a shape and color sorting activity. I took a 12x12 piece of cardstock and drew shapes on one side and color squares on the other. I then "laminated" it with some clear contact paper and included a bowl of multi-colored foam shapes for the sorting. I think this last busy bag will probably be Elijah's favorite. 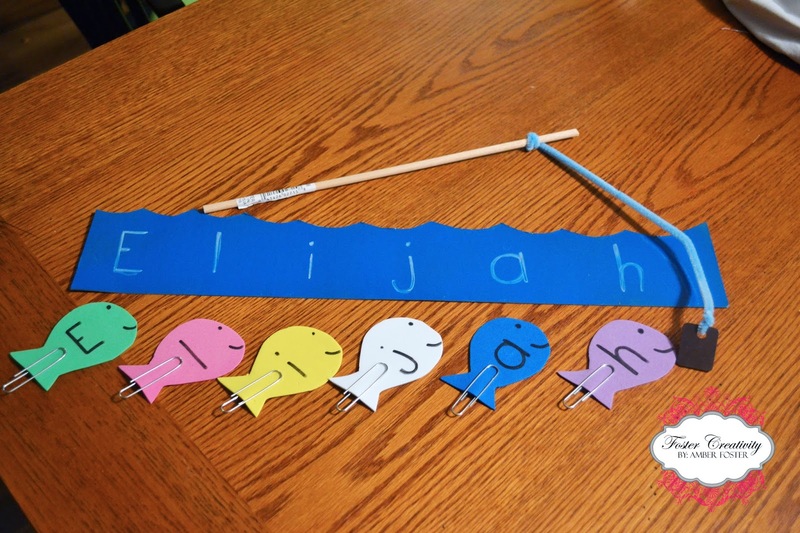 I cut out 6 foam fish and wrote each letter of his name on them and attached a paper clip. I then made a small fishing pole from a dowl, pipe cleaner and a magnet. After he "catches" each fish he can match it to the letter of his name in the water. Hopefully these will do a good job of keeping my little man busy while we are at the Dr. tomorrow, because sometimes it can take a bit! If not I have the ipad for backup;) If you would like more busy bag ideas, then please follow me on Pinterest. I have several more pinned that I have yet to make. *I just wanted to let everyone know that these worked fantastic! We forgot to charge the ipad last night, so these were all we had for entertainment at the Dr.'s office and I must say they held his attention better than the ipad usually does. It was so much less stressful than chasing him all over the office. I will definitely be making more!